Dude With New Sneakers Jumps Into Puddle Of Death! This is extremely unusual but very funny! That being said, I have a few “beefs” with this video. 1. WHY on earth is there this big of a puddle anywhere public?! It looks like it’s in a parking lot somewhere, a cute old lady could easily walk over this and never been seen again. Even if you drove over this your tire would go in it and the frame of your vehicle would probably smash into the pavement. Unbelievable, but if someone wants to collect some money and sue the owners this very well might be the place to be. 2. WHY does the guy taking the video have such an annoying laugh?! Was he born this way? Did he pick up this nasty habit along the way? I have many questions for this chap but overall I would have enjoyed this video a lot more if someone taped his mouth shut or he wasn’t present. I’d say #1 probably a small sink hole; it wouldn’t have been there for long and #2 I know a LOT of terrible laughers…he isn’t the worst I’ve heard…unfortunately. OMG – our parents used to warn us this kind of thing would happen if we kept digging holes in the yard. Stuff would fall in and go all the way to China! Community pool project gone awry? I agree completely what else are we suppose to use. I just cant resist the Q-tip! Instant classic! Totally something me and my friends would have done. Going to twitter with this one. Should it still be called a puddle when it’s 6 feet deep? He says he doing it for the kids right before he jumps. What that to show the danger, or how stupid he was? 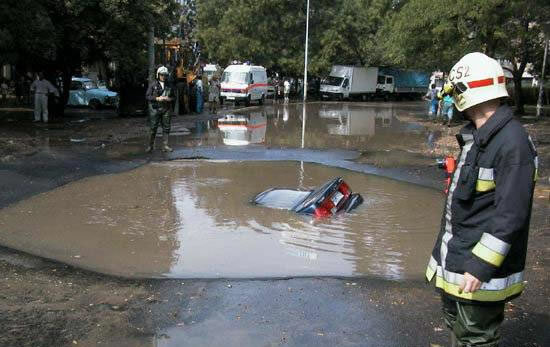 I’ve seen small sink holes fill with water before, but never anyone jumping in…too funny! That was a black hole! Hahaha! Yep, he sounds like a guy when he talks but he laughs like a girl. Still, pretty funny. I never thought of puddle jumping as a death defying activity before. It’s better if you turn your speakers off, the laugh was so not-genuine. The plunge in the grunge,however, was quite funny. Nice looking site, easy to get around on. Keep up the good work. I think his laugh is hysterical! But then again, I’ve been told I have an annoying laugh! I don’t know what was funnier…did he not know it was so deep? That laugh! WOW! Can’t believe this puddle! And, yes, definitely too big for a puddle! Thanks for visiting my blog and making me giggle! Like he said; my kids loved it. (Dr Foster.) I’m sure he knew and is enjoying the fame. Yikes! (and then he disappears!) Funny video, but likely staged. Thanks for visiting my blog and liking “Baby Takes the Prize” – hope it also gave you a chuckle. you’re right – awful laugh. but it WAS funny! I would totally do that to one of my friends. And tape it and laugh extra-annoyingly. I never believe these videos. They all look like set-ups to me. I mean, how is it that you just happen to have a video camera in you hand when the cat falls into the bath, or someone falls into a giant puddle? They are funny, but like comedy sketches are funny. Very pertinent comments by the way. I think the guy with the laugh dug the hole himself, he sounds demented enough. I’m pretty sure it was set up. Like the “victim’s” friends knew it was huge so they dared him to jump in a puddle with his new shoes. Intense prank haha. Glad you liked “on a string.” Hope some other quips fit your interests and/or concerns. Hard-enough rain causes a puddle as big as the one above at a railroad underpass in our city. Many years ago, as kids we swam in it till it drained away. Wow, what a deep puddle, How did it get that deep! Thank you for visiting my log! I like yours. Yes…very annoying laugh! That was funny though. Thanks for dropping in to like one of my posts. Interesting blog you have here!